As well as being a decorative painter, I am also involved in the international paper-folding community. At a recent gathering in Freising, Germany, I came up with this stylised design for a bat – “Vespertilio“. I am fascinated by the Art Nouveau and Art Deco periods; the use of geometry and patterns to create intricate friezes and designs amazes me. My fondness of Art Deco decoration has inspired me to create this paper bat which simply uses a 2 x 1 rectangle, radial pleats and three cuts. This design can be folded from any paper, but I would recommend using a thicker paper to facilitate creasing. In this case I have used 110gsm Elephant Hide, known for its structural qualities. With help from my very supportive partner Eric Gjerde, I have put together a PDF document that includes a diagram and photos of how to fold this bat if you wish to fold your own. You can download it via the following link. 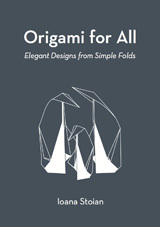 UPDATE: This model, with full diagrams, is featured in my new book, “Origami for All: Elegant Designs from Simple Folds“.